September Silent Auction, TWO Works! Congratulations to P. Krokstedt who placed the winning bid of $2,750 for August's silent auction painting "Village Gorodische", by Piotr Serapionovich Krokholev, estimated at $5,500- $6,500. 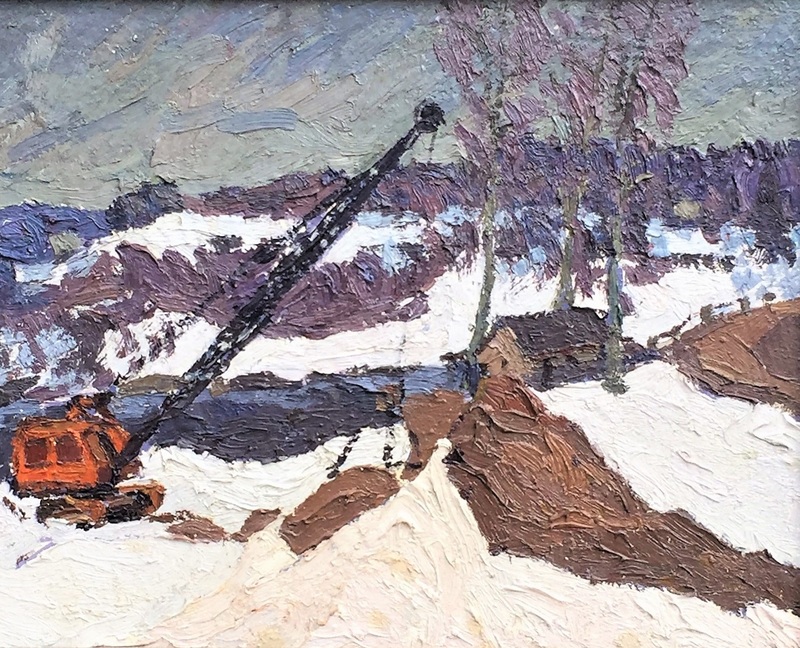 This month we are excited to present a special work, "Sand Pit" by one of our exceptional and unique artists, Veniamin Alekseevich Safonov, estimated at $4,000 - $5,000. Of the hundreds of Russian artists we at the McCarthey Gallery have met and represented over the years, Veniamin Safanov is truly singular. The artist's brand of impressionism is a touch more abstract than most of his colleagues of the period. His thick paint, textured work and bright colors mark him as a favorite for both collectors and critics. The current bid for the two Krieger-Rick's framed, paintings by a renowned artist is just $1,500! This is truly a rare opportunity to add very unique works of Abstract Impressionism to your collection. 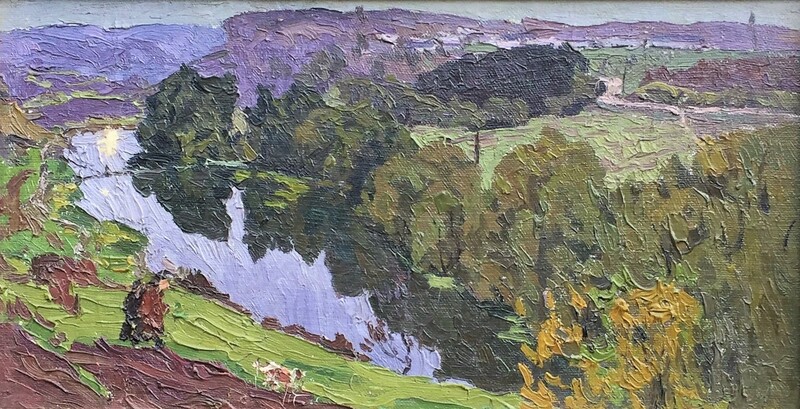 Veniamin A. Safonov, "Lilac River"
As a Singular artist, Veniamin Safonov's works are instantly recognizable. Long, heavy strokes of the paint brush, bright colors, strong contrasts of light and shadow are characteristic of the artist's paintings. Veniamin Safonov is a graduate of the internationally famed Moscow Surikov Institute, and a Member of the Union of Soviet Artists. His works are showcased in the Tretyakov Gallery (Moscow) and other museums of the Russian Federation as well as favoring many private collections. Rarely have we offered paintings by artists of Safonov's acclaim in our monthly silent auction. If you've never participated, this month is a great time to start. This is a rare opportunity to acquire a work that could easily be included in the collections of the top museums in Russia. We invite you to participate in this month's auction and thank everyone who placed bids last month. This is an exceptional opportunity to add a beautiful work by a noted artist to your collection. Estimated at $4,000 to $5,000, the current high bid is just $1,500! The next bid is $1,750, followed by minimum bidding increments of $250. Remember, there is no reserve, at the end of the auction the high bid wins! Bids will be taken via telephone, or e-mail until 7:00 pm MST, Tuesday October 3rd. Follow all the bidding updates on the Gallery's website. Safanov was born in the Krasnaya Zarya Village (Orlovskaya Region, south of Moscow) in 1931. It was, and still is, a small community of fewer than 2,000 residents. In his childhood, the artist survived three years of German occupation. One of the biggest battles of World War II (known to Russians as the "Great Patriotic War) was the Battle on the Orlovo-Kurskaya Arch, which took place near his village in 1943. This traumatic event made a deep impression on the young artist, and it remained with him for his entire life. At that time, the German Army was retreating to the West, burning everything in its path, including villages and farmland, and holding thousands of Russian people hostage. Safonov moved to Podolsk (Moscow Region) in search of an art career. In the beginning, he tried to paint genre scenes, portraits and landscapes. He had been working en plein air, observing changes in season and time of the day. The artist learned more and more to understand nature, and to reproduce nature's conditions on canvas. In the course of time, the challenge of landscape works captured the young artist completely. Within only a few years after his graduation from the Surikov Art Institute, Safanov's paintings were exhibited not only at All-Union Art Exhibition (the most prestigious artists' exhibition in the Soviet Union), but were also awarded with a Diploma. The artist was then sent to work in the Academician Arts Cottage. This was truly exceptional, as it was rare that the paintings of an artist who was not a member of the Union of Artists would be presented at an Exhibition of such high rank. But when the paintings were chosen at first by Artists' Regional Branch (by a specially established body, the Exhibition Committee), Safonov was automatically accepted as a member of the Union of Artists. It was in this most extraordinary way that Veniamin Safonov became a member of the Union of Artists. The opportunity to visit the Academic Dacha - named after Ilya Repin - gave the artist a new creative impulse. For the first time in his life, Safonov became acquainted with the creative works of famous and honored artists of the older generation, whose advice was very useful to him and advanced his knowledge of art history as well as of artistic techniques. In the course of time, Veniamin Safonov's painting acquired its unique and recognizable features. Long, heavey strokes of thepaint brush, bright colors, and contrast of light and shadow are all signature characteristics of the artist's works. Safonov uniquely conveys the full variety, texture, light, and feelings of Russia's natural beauty. A graduate of the famed Surikov Art Institute Moscow, Safonov's paintings are found in the Tretyakov Gallery and other museums of the Russian Federation as well as in private collections. A member of the Union of Soviet Artists, Safonov specialized in landscapes and was one of the leading artists of the Moscow region. 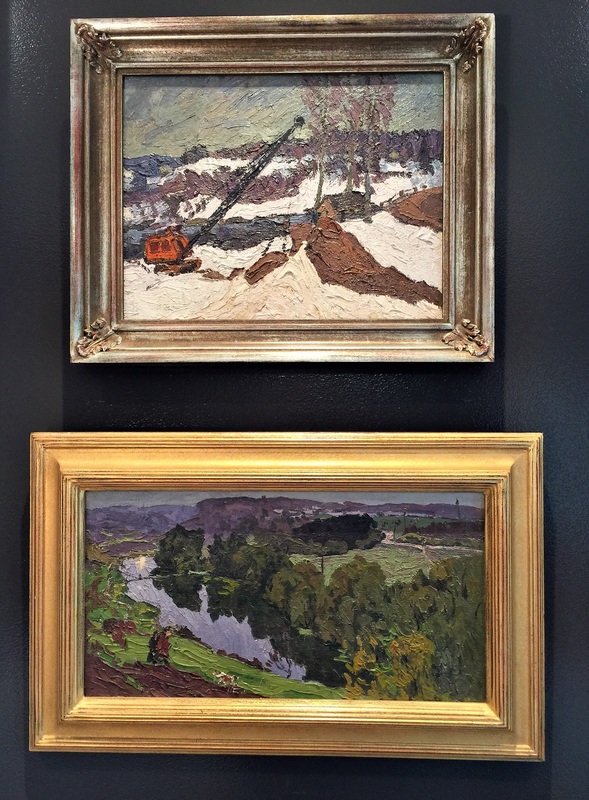 The two Safonov's could be the highlights of your sitting room!